I’ve had some questions about how to create the continuous bias tape for the piping I mentioned in my last post. I’m re-posting a tutorial I put together last October for my other blog, Pretty Jane. My students in the Intro Sewing class all make continuous bias tape. I make it right along with them each month, and give them a copy of printed instructions courtesy of the Dread Pirate Rogers, but have always wanted to have better photos to offer. 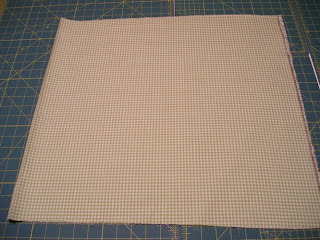 While I was busy making the changing pad cover for New Baby, I went ahead and shot some photos of the CBT process with the gingham I used to wrap the piping. 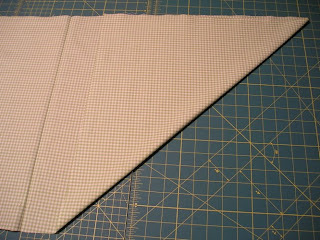 Bias tape, very simply, is just a strip of fabric cut on the bias–the 45 degree angle across the grainline of the fabric. 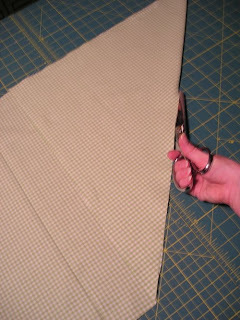 It has the most give you can get out of a particular cut of fabric, and allows you to bind curves and seams, wrap piping, or edge finish a project. 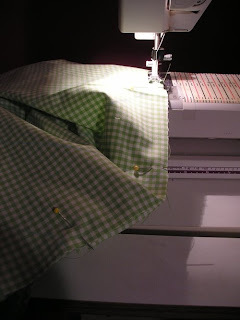 It’s great stuff, I use it all the time, and knowing how to make and apply it will revolutionize your sewing–honest. You can easily make bias stips just by slicing across that bias line. 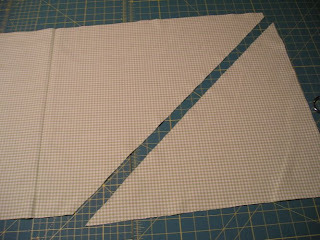 This is the technique I use when binding armholes or necklines, something relatively short. 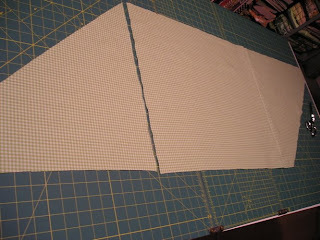 When I need longer pieces, though, I’d be forced to stitch each of those strips together into one longer strip, and that’s a huge pain in the behind, as far as I’m concerned. 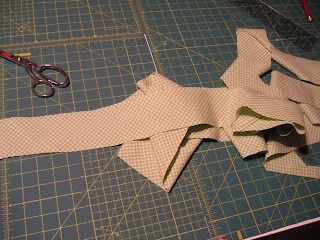 It’s much easier to make CBT–Continuous Bias Tape–by stitching a larger piece of fabric together on the bias and then cutting THAT into strips. You get piles and piles of bias tape this way, and you get the freedom to choose any fabric you want rather than being limited to the solid, poly-cotton blend available at the fabric stores. 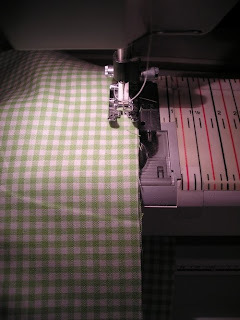 You can also manipulate the width of the bias tape better–I’ll elaborate on that at the end of the post. So, how do we make CBT? Golly, I’m glad you asked. 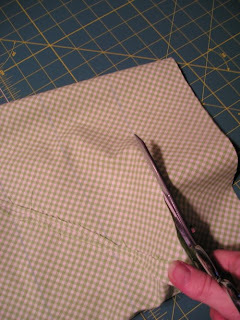 Trim off the selvedges of your fabric. 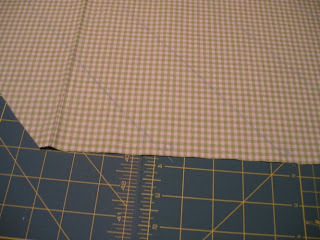 (Selvedge edges shrink at a different rate than the remainder of your fabric, and should always be removed–even if it feels like a huge waste of a straight edge!). 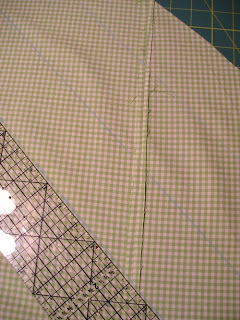 Bear in mind that as you match these lines up, they’re at an angle, so they won’t match one another on either side of the fabric–they’ll actually cross one another. 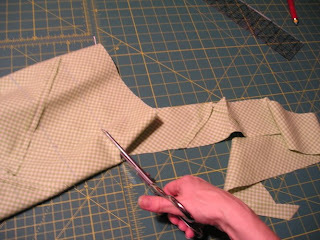 You’re going to put in a seam that will run through the point at which they cross. 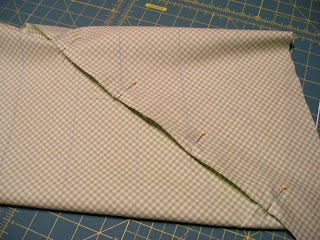 Just keep pinning and matching the best you can–it’s much more important that your seam lies flat than that your numbers and lines match flawlessly. You should end up with something hopeless that looks like this, and will almost certainly be thinking, “This lady is nuts, and this is never gonna work.” Hang in there! 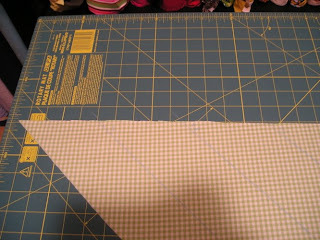 Hope the images helped, and that the length of the instructions doesn’t intimidate–the first time can be a rough road, especially if you’re teaching yourself, but after that it’s SUCH a quick, simple process that I know you’ll make it a regular part of your sewing skill set. the Dread Pirate link wouldnt open for me. Any suggestions? Oops! Thanks for catching that, Yael! I’ve updated the link and gotten it working now. All better then. More people need to see this post! It’s fantastic! 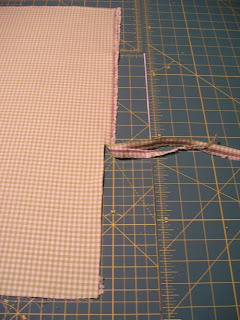 This is how I make binding but you have explained it far better than most. However, I do use a square and you are right, I am not going to start using a rectangle, thanks! This sounds fascinating. 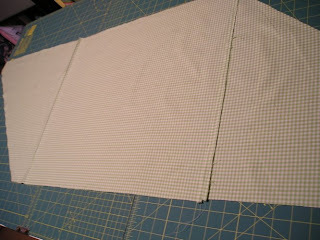 I hate making binding and to be able to make a bunch in one go would be worth while! If you don’t mind I would like to link to this tutorial on my blog.Thanks so much! Great tutorial, and I'm going to try it right away. 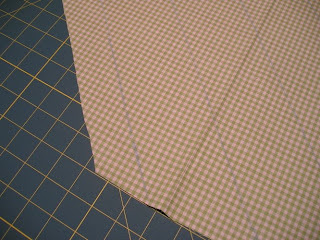 I make a lot of dresses for my daughter, and my favorite pattern rquires quite a bit of bias tape. How wonderful to be able to make it! 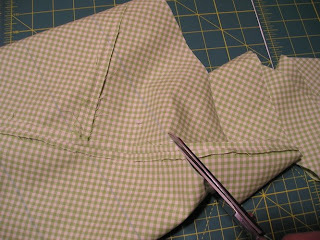 One question though…when you rolled the fabric off the bolt, and cut off the corner, is the fabric folded in half lengthwise? 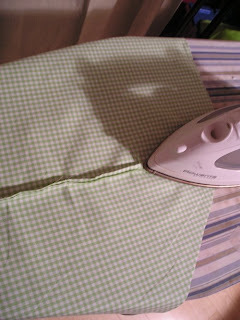 Or do you use the fabric without it being folded? Thanks so much! Hooray! You helped me have yards of yellow with white dots bias tape. The pics and instructions made all the difference for me! WOW – that was so simply explained! I will be making some bias tap in the VERY near future!! THANK YOU!!! Thanks for the tutorial! I think I'm going to give it a try soon. Would you recommend a certain kind of fabric? 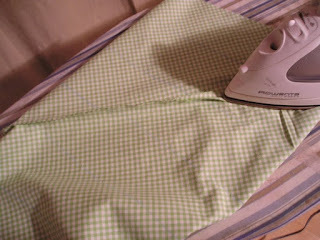 Does any cotton quilting fabric work? I'm planning to use it around oval placemats and I wanted to make sure it would conform to the rounded edges well enough. Thanks so much! Ok, this is amazing! My daughter in law just told me about doing it this way. Tried it tonight and I’m hooked! SOOO much better than sewing all those little ends together and pressing them individually! Excellent instructions! I made some bias tape – enough so that I thought I wouldn’t get to the end of it! I don’t suppose there is a video of this anywhere??? Not currently, but what a great suggestion! I’ll have to add that to the list of things to make sooner rather than later. Might be helpful for a lot of folks! A video would be so helpful! I’m a newbie teaching myself with the aid of your awesome book. I absolutely love the book but I’m having a tough time figuring out exactly what I’m aiming for (right in that spot where you say here’s where it can get confusing) The picture shows the numbers lined up but then I see here on this tutorial they are offset. A video here would be perfect. I did this technique once, long ago. It was in a pattern that required yards and YARDS of bias tubing. Then, I didn’t have the pattern any more, so lost the instructions. Am so glad to have found your clearly written instructions as it is so much fun to have your own bias tape! I’m so pleased they’re helpful to you! I feel like once you do it one or two times, you really can make bias tape super fast–and since I’m a major geek, that’s a ton of fun for me. Great tutorial, Deborah. I’ve been sewing 40+ years and this is the clearest set of instructions for this method I have found! 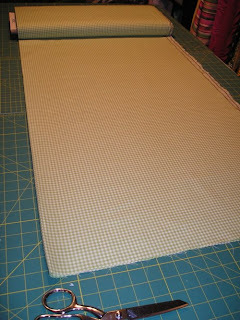 One added tip I discovered: Place a narrow cutting mat (mine is 18 x 24) on the ironing board and it’s easy to use the rotary cutter without fear of accidentally cutting through the bottom layer. Thanks so much for your helpful lesson!! thanks so much for making a difficult sounding process so easy! The pictures were a great help as I had to keep referring to them during the process of making the binding. I love it. You just made me one step closer to finishing projects and getting them listed on my etsy account. It took me a couple of tries lining up, but now I just take a few more minutes pinning it correctly and shazam! Thanks for the tip! Hi, Mary! 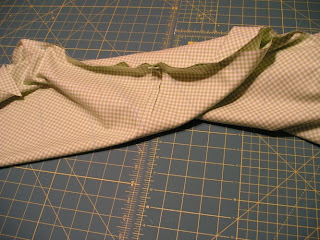 There IS video of this technique as part of my Essential Sewing e-course–along with 30 more lessons. The link is here if you’d like to learn more: http://whipstitchfabrics.com/blog/e-courses/ Hope that helps! 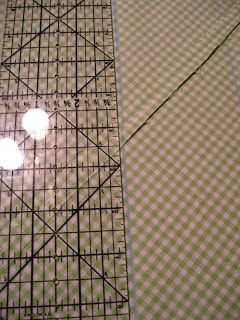 I have worked several hours trying to make a continuous bias strip from a printed quilting chart without success. The pictures didn’t make sense to me but I did follow directions. Your do appear to be something I can understand. 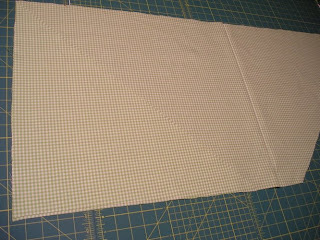 I need several long strips of contrasting fabric to go on the bottom of a childs dress.Thanks so much for your tutorial. Thank you! Great tutorial and I’ve successfully made heaps of bias tape for my cushions! Some of the photos warp the shapes a little bit due to perspective but the tutorial works a treat!